This entry was posted on January 27, 2015 by Jessica Anderson. It's that time of year again...time for our annual trade show! Trophies2Go is an active member of the Awards and Recognition Association, also known as the ARA. This niche association includes over 1800 awards companies and suppliers. Trophies2Go President Jeff Anderson serves on the ARA Board of Directors as the Chair of the Membership and Technology Committees. At this week's International Awards Market, wholesale award suppliers introduce new products and display samples of their hottest sellers. Certification classes and seminars offer educational opportunities to attendees. Located at the Rio Hotel in Las Vegas, I'm choosing my party dresses for 3 days and 2 nights of learning and camaraderie with our friends in the trophy industry! 1. International Awards Market: At this annual event we meet face to face with our suppliers, touch and feel new products, network with others in the industry, and attend many educational classes. The event is free to ARA members and staff. 2. Member to Member Forum: This free online resource allows ARA members across the country to network with one another. The forum allows members ask questions about products, discuss marketing ideas, or share industry news. Just this week I used the forum to locate a product for a customer, resulting in a sale and a happy customer! 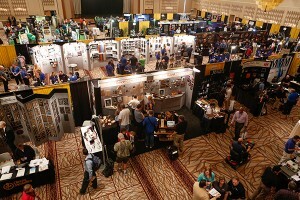 Wholesale award vendors exhibiting at the ARA trade show in Las Vegas, NV. 3. Recognition Review Magazine: Each month we receive the ARA magazine, Recognition Review. I always read through the latest edition to find out what is trending in our industry. 4. ARA Members: Because of the positive nature of the business we are in, my experience with the ARA is that members tend to be outgoing, friendly, and generous people. Our industry is unique in that most of the members, who happen to be competitors, help each other out - whether it's finding a product needed for an order, sharing better ways to do business, or being a supportive during hard times. We find that by working together we make the industry as a whole stronger. The motto "the rising tide floats all boats" fits well for our industry. 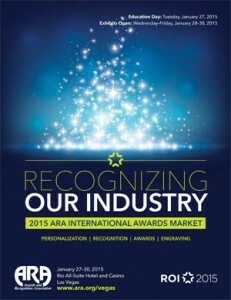 If you are in the awards industry, consider joining the ARA. You will be glad you did - I'm very grateful for the friends we've made over the years. See you in Vegas for another great show!